I grew up watching the movie of The Sound of Music every year. My mother saw to it that I never missed the annual broadcast, usually during the holiday season. My Aunt Beth had the lp of the movie soundtrack and I always listened to it in her den when I visited her. I knew (and still do) every song by heart. After I grew up and as soon as it was available on DVD, I had to buy it. Although I've never seen a stage version, I am now well acquainted with the original cast album with Mary Martin. 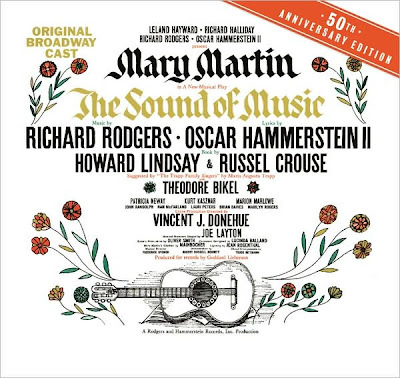 To celebrate the 50th Anniversary of Richard Rodgers and Oscar Hammerstein's The Sound of Music, Sony Masterworks Broadway has issued a restored original cast recording. Included are three unusual bonus tracks, extensive liner notes about the show's history by Bert Fink of the Rodgers & Hammerstein Organization, and rarely seen photos of the recording sessions, held November 22, 1959, in Columbia Records' celebrated 30th Street Studios. Today, Monday, November 16, 2009 at 5:00 PM, Barnes & Noble "Live at Lincoln" (Lincoln Triangle, 1972 Broadway at 66th Street) will present The Sound of Music: 50th Anniversary Celebration presented in conjunction with The Rodgers & Hammerstein Organization. Original cast members Theodore Bikel ("Captain von Trapp"), Lauri Peters ("Liesl") and Brian Davies ("Rolf") will talk about the original production, its creators and its inimitable star (the late Mary Martin). Sharing stories about Maria von Trapp, whose true-life story serves as the musical's basis, will be her grandson, Sam von Trapp. Laurence Maslon (author of The Sound of Music Companion ) will moderate the panel, which will also include Bert Fink, author of the new children's book adaptation, and the CD’s new liner notes. The event will be introduced by Ted Chapin (President of The Rodgers & Hammerstein Organization). And like icing on the cake, the effervescent Kate Baldwin will be on hand to perform the title song! Perhaps her performance will serve as an audition for a revival of The Sound of Music, which was last seen on Broadway 10 years ago. Click here to listen to tracks from the remastered album.